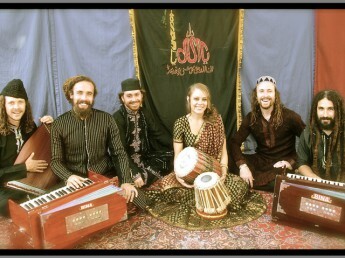 Qawwali is the most explosive sufi devotion music of the Indian Subcontinent. It is of no surprise that of all world genres it is qawwali that has gained an increasing amount of international appeal. The Fanna-Fi-Allah Sufi Qawwali Ensemble is a leading representation of this music worldwide. Through their consistent high profile appearances in both Pakistan & abroad they have captured the hearts of thousands. The intensity of their stage performance with its smooth melodic overtures, fierce leaps of vocal passion ridding on heavy rhythmic grooves & rich vocal choruses have captivated audiences in Pakistan, India, North Africa, Thailand, Indonesia, the USA and beyond. Qawwali is a passionate devotional practice in which the fire of divine love (ishq) is ecstatically expressed through the mystical verses of Sufi poets, sung in Urdu, Farsi, Hindi and Punjabi. The origins of Qawwali music date back about a thousand years to the first sufi mystics who came to India. Qawwali has evolved into an immense art form spanning over hundreds of years of poets, languages & musical evolutions. Qawwali is associated with the ‘sama’ – a spiritual gathering of the Chisti Order whose religious context serves to bring members of the order into trance-like states, that makes them more aware of their relationship with God.